Government for the second consecutive Friday today disallowed congregational Friday prayers in the historic Jamia Masjid Srinagar. 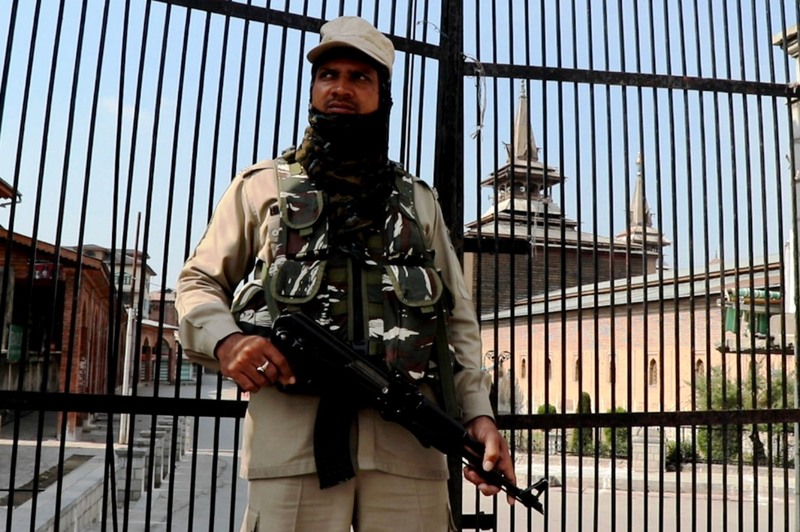 CRPF man deployed outside the Historic Jamia Masjid in Nowhatta area of Srinagar. Reports said that men in uniform had locked all gates of the Jamia early today and all roads leading to it were blocked. Curfew-like restrictions were imposed in and around Jamia in Nowhatta area of the old town, they said. Meanwhile, Hurriyat Conference (M) chairman Mirwaiz Umar Farooq slammed the state government for imposing curbs on Friday prayers at the historic Jamia Masjid in the old City of Srinagar.